What wine lover wouldn't love this handy, portable, all-in-one keychain bar tool with its elegant mini wine bottle shape? Each wine opener favor is 3" x 1" x 0.5" and has a metal chain and key ring top as well as a set of retractable blades and corkscrew tucked inside. 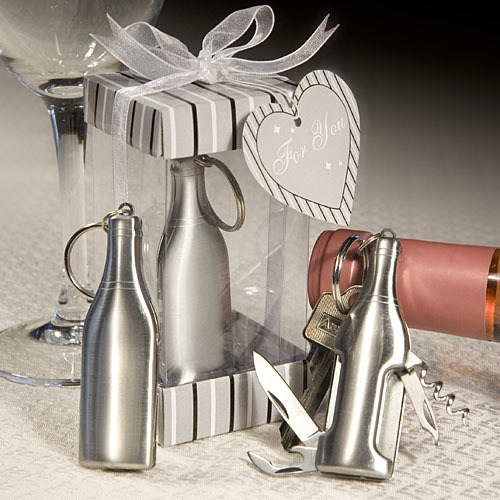 In addition, each wine favor comes attractively packaged in a clear plastic display box with a silver, black and white striped top and base, is tied with a white organza bow and an attached matching striped heart shaped "For You" tag. Please allow 5 business days to fulfill your wine opener favors order. Then add ship time from NY.